Nothosaurus, the name Meaning “false lizard”. The fossils were found all over the world. These were mammal like dinosaurs. They breathed air but it’s obvious that they spent most of their time in water, except to lay eggs. They had very long necks, paddle webbed feet, long sharp teeth, and were about 10 feet in length. 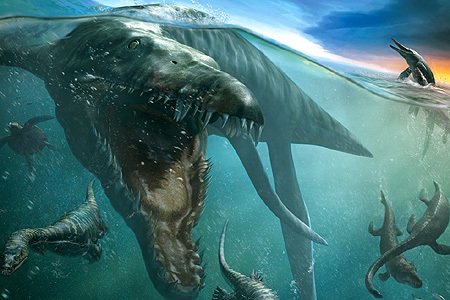 The Nothosaurus also are known to be the earliest sea-living reptilian hunters of the waters. They were around the Triassic era from beginning to end. There has been many full fossil structures found, one excellent species can be seen in the National History Museum in Berlin .